With Masahiro Tanaka‘s contract opt-out looming after this season, the Yankees would be wise to think about signing upcoming free agent pitcher Yu Darvish. The narrative of the 2017 season, aside from all things Baby Bombers, will be the worry over Masahiro Tanaka enacting his opt-out clause come next fall — whenever it is that the Yankees season comes to an end. As I’ve written about in the past, this is all contingent upon Tanaka not only having another stellar campaign as he did in 2016 but more importantly, staying healthy. If Tanaka honors the remainder of his deal, he’s looking at 3-years/$67M. 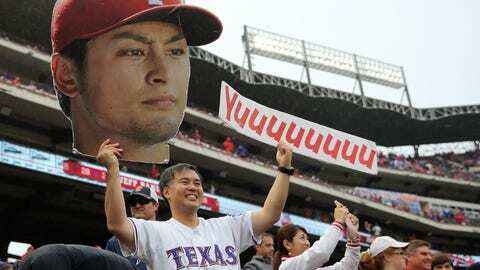 While that’s nothing to shake a stick at, it’s nowhere close to what fellow countryman Yu Darvish of the Rangers could be looking at this offseason. According to Evan Grant of the Dallas News, he believes the framework for a five or six-year deal worth $30M per, for Darvish and Texas is there — though neither side has initiated extension talks. Does that last line sound familiar, Yankees fans? How we’re all waiting with bated breath for the once in a lifetime 2018 free agent class to arrive. Well, guess what, we’re not alone! Otani, Manny Machado, Bryce Harper, Matt Harvey, and so on. The 2017 offseason is lining up to be another dud in terms of big name available players — unless of course Tanaka and Darvish become available. Most Yankees fans are clamoring for the club to secure the services of Machado and Harper, but what about reinforcing the rotation? After all, that’s this team’s real deficiency. And this is with Tanaka still in tow. Let’s say for instance Tanaka has a so-so year and decides to stay put at his current salary. Teaming him up with Darvish at the top of the rotation would make for an epic one-two punch. On the other end of the spectrum, if Tanaka opts out (as I expect he will), Michael Pineda and CC Sabathia also leave via free agency — the Yankees can take those expendable millions and give Darvish his 5-year/$150M deal (though, I’d prefer 4-years/$120M). I get that it’s a lot of money for a pitcher turning 31 in 2018, but the man has already gone through his recovery from Tommy John — something we’re all inevitably waiting for Tanaka to succumb to (let’s be honest). After missing all of 2015, Darvish returned with a 7-5 record, a 3.41 ERA, 1.116 WHIP, and 132 strikeouts in 100 innings pitched. Add in the fact he only walked 31 batters and his fastball was regularly clocked at 98 mph, and it’s clear to see that Darvish will only continue to get stronger post-surgery. For those of you who still feel Darvish will inevitably be another money pit — a la Zack Greinke in Arizona, Grant makes a wonderful counter argument. Skeptics will say they don’t want either pitcher suiting up for the Yankees in 2018. To that, I shake my head in disappointment. As much as I worry about Tanaka, he’s been the most reliable shooter on the staff since his arrival to the Bronx in 2014. So I’d rather not see him leave but that’s up to he, his reps, and the Yankees front office. Next: What Is Yankees Captains Camp? Want your voice heard? Join the Yanks Go Yard team! Should Tanaka command somewhere near $200M, I’d say sayonara! Instead, I’d place my focus on the three-time All-Star who’s stint in Texas could be coming to an end. With all these Baby Bombers and potential free agent sluggers to be, the Yankees are still going need a veteran presence to solidify the rotation.